Expect at least 30 to 40 hours of gameplay, pre-update. At Comic-Con in New York this past weekend, I had the opportunity to sit down with Yosuke Futami, the producer of the upcoming Sword Art Online: Hollow Realization. During our discussion, we talked a bit about the game’s concept, its length, and more. Why did you decide to return to an Aincrad-like setting with Ainground instead of jump to the expected Gun Gale Online? How long can we expect the game to be? You have all these characters you can recruit for your party. Why did you decide that only Kirito is playable? Futami: “So in this game the player can only control Kirito, and the others are your party members. One of the main elements of your party members this time is that you can give them orders or commands to tell them what you want them to do in battle. It takes time to put together your best party members—there’s over 300 to recruit—and if you could control the other party members, I don’t think you’d have the time to find your best to develop and organize. That’s why I made only Kirito playable. Can you talk a bit about the post-launch update you announced at Tokyo Game Show 2016? We’ve only see the PlayStation 4 version of the game so far. How is the PS Vita version coming along? Is there cross-save or cross-play? 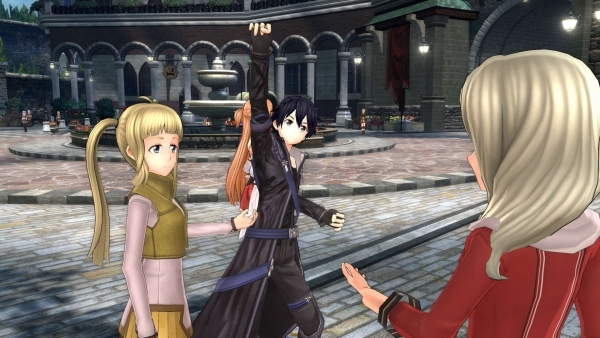 Do you see PS Vita as a relevant platform for Sword Art Online going forward? I know it’s still a popular platform in Japan, but how long do you see that momentum lasting? You recently announced Accel World vs. Sword Art Online. Can you share any information about that? PlayStation VR is about to release. What are your thoughts on that? If you missed it, catch our most recent update on the game here.